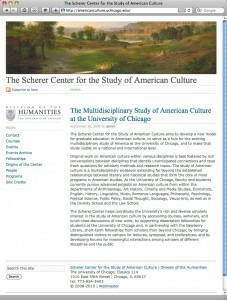 The Scherer Center for the Study of American Culture aims to develop a new model for graduate education in American culture, to serve as a hub for the exciting multidisciplinary study of America at the University of Chicago, and to make that study visible on a national and international level. This is a very simple site based on the Tarski WordPress theme which was put together at short notice for the center. 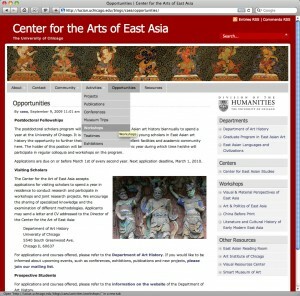 Each section on the site corresponds to a WordPress page. The theme’s horizontal navigation bar was turned off in the theme options in favour of a Page widget displayed in the sidebar.